Almost all Mercedes W123 E Class cars sold in the USA were diesel powered. The OM617 diesel engines move these cars at a snails pace, but have the reputation for being nearly un-killable. The rest of the world had much greater choice in both engines and transmissions. Large USA spec bumpers were an definite eyesore in comparison to their slim euro counterparts. Today's euro spec wagon has a 2.3 four cylinder engine most commonly found in the later W201 190E. 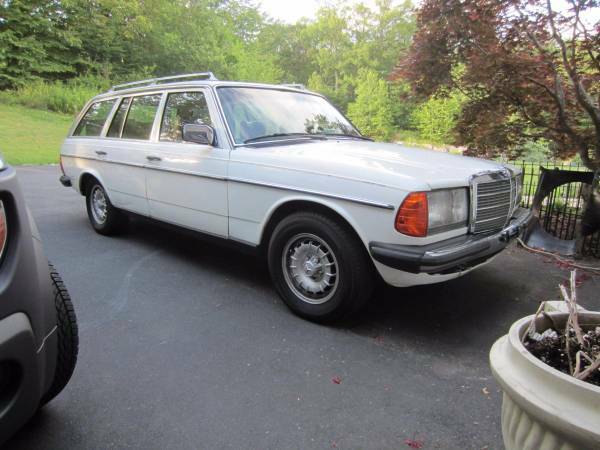 Find this 1980 Mercedes 230TE 4 Speed for sale in Kinnelon, NJ for $5,000 via craigslist. This gray market Benz was bought in the summer of 2013 as a project. The seller replaced all the floors in the car and chased away all the existing structural rust. Some cosmetic rust on the exterior of the car needs to be addressed. New quarter panel patches are included in the sale. 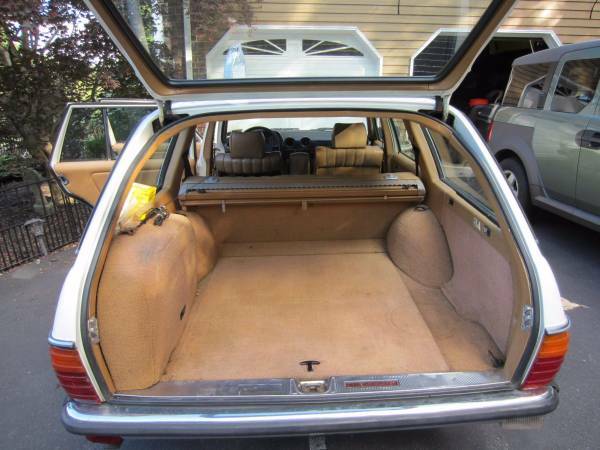 The seller got through the initial rust work, but then had to put the car on the back burner because of a move. The car is up for sale now as the seller has to move yet again and is forced to sell off this car and some others. The seller bought the car with the SLS (self leveling) hydrallic rear suspension in good working order. He performed a compression test on the 135 hp M102 engine and all cylinders were within 5% of one another. The car has approximately 180,000 miles on it with 140,000 of them coming after being imported to the USA. The car is said to drive and run great. Air conditioning blows cold and the car retains all euro features. The euro headlights cast dramatically better light pattern than the USA counterparts. 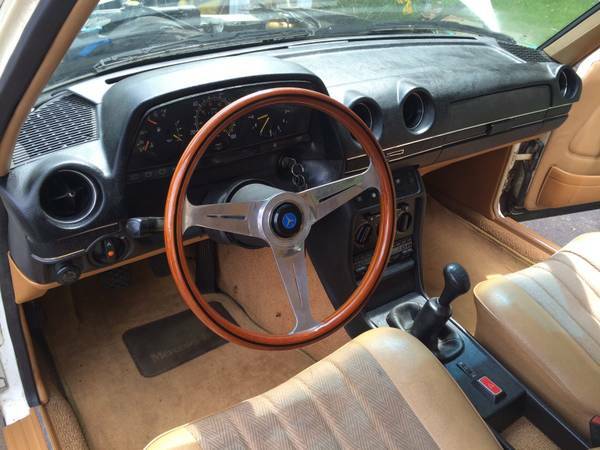 The car is fitted with a period correct and super cool wood Nardi steering wheel. 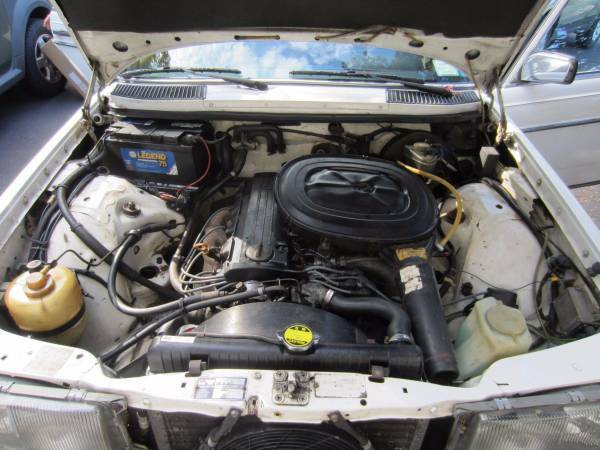 The seller mentions he was thinking of installing a small block Ford V8 at one point in time. Cory bought a Mercedes W124 coupe manual transmission driveshaft on eBay for 99 cents this week! Looks like the one installed in/behind a '74 Mgb Gt in my garage.